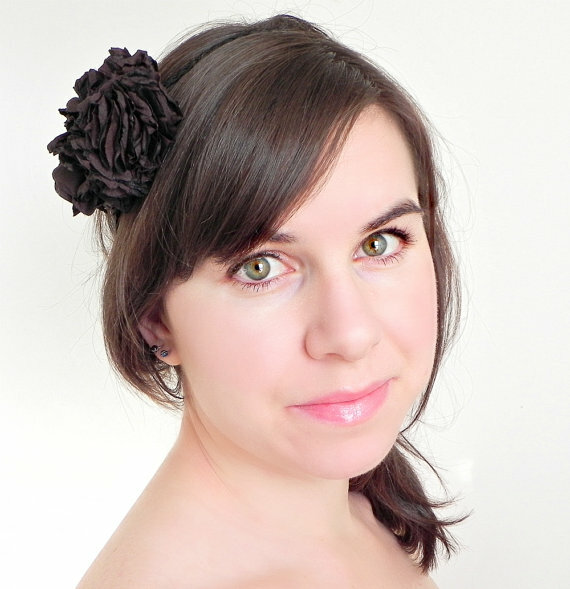 Katherine creates pretty accessories that are entirely well made, fabulous and fanciful . Her Etsy Shop is full of gorgeous goodies that make me wish I could wear feathers in my hair everyday! I love searching for and collecting materials, like fabrics and beads and feathers and fibres, and then challenging myself to make something beautiful from them. I get really excited about making things from other things that I love. 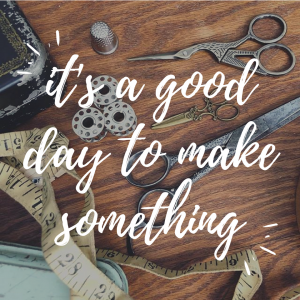 I look at a fabric swatch, or at a jar of beads, and think, “what can I do with this?” Then I plan – I love this part – and experiment, and look forward to the feeling that comes along with creating something that you hope someone will love just as much as you do. Aside from being fancy what do you do? I like to say that I make an effort to exercise both halves of my brain as much as possible. In real life, when I’m not making fancy things, I’m a wife and a mother to a cute little 16 month old button named Innis, three giant dogs, and a fat, orange cat. I’m a blogger and a copy editor. I like to organize things, which lends nicely to an editing career. I am also a high school English teacher, or have been, but am currently content to be at home with the boys, flexing my entrepreneurial and creative muscles. What is the first thing you can remember making? One of my first memories is of trailing my Mum around the house, markers and paper in hand, taking “requests” for drawings. Did she want a horse today? Or a cat? Or a horse? (I had a limited repertoire at that age). My Mum always encouraged us to be creative. One of my favourite spaces as a child was the hallway airing cabinet, which (lucky for me!) was eventually converted into a craft supplies closet, maybe around the time when my early tendency to hoard pretty craft materials became apparent. I would spend hours in there, planning projects, organizing the materials … you know, all the fun and whimsical things children do when faced with countless markers, crayons, beads, felt, glue, and sparkles. They organize them. I also drew a baby leopard in grade seven that I was particularly proud of. I love sitting in bright pools of sunshine. I love hot drinks, and good books. I love writing and creating. I love any kind of art that makes my heart bump. I love being a Mum. I’m loving the real-life experiment of watching my son grow into a little boy. I love my pets. They’re all rescues, the dogs coming from the Northwest Territories where we taught for five years and also ran a dog shelter on the side – and I feel like we owe them huge for making life “up there” tolerable and safe. Plus they’re soft and snugly, which is an added bonus. I love my husband because, among other things, he lets me overrun our house with projects. To me, handmade means making something new from materials that inspire. It’s about painstaking details, and cramped fingers, and patience, and an enduring hope that the final result will be just as beautiful as you’ve envisioned. It’s about dreams, and an appreciation for beauty, and an excitement for adding something to someone else’s life that will make him or her really, really, really happy. 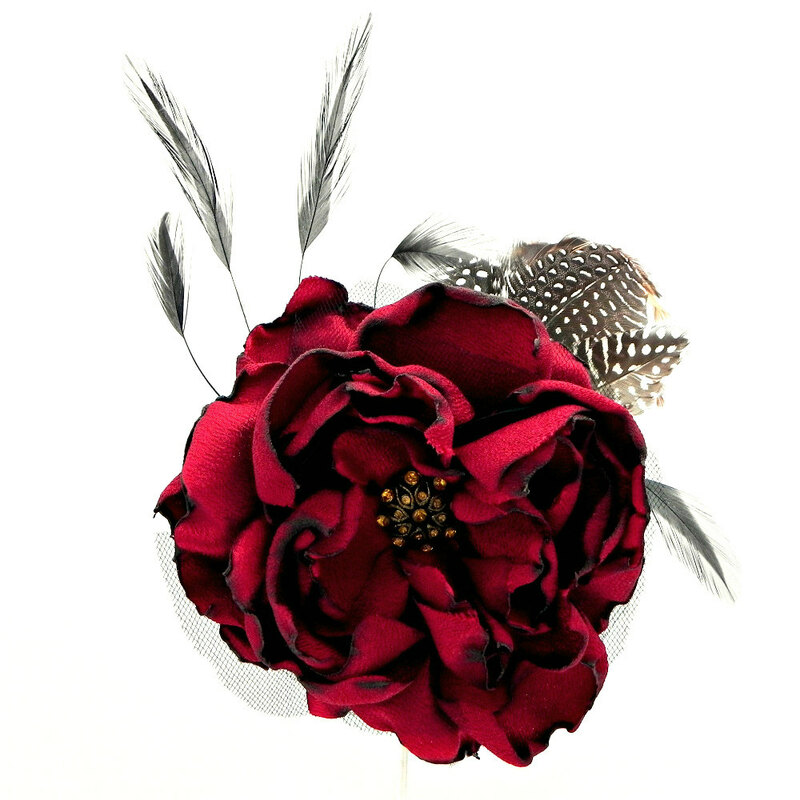 Be sure to visit the You Fancy Thing Online Shop where Katherine is offering a coupon code for 15% off her lovely creations. Just enter the code FERNFRECKLE15 during checkout to receive your discount! 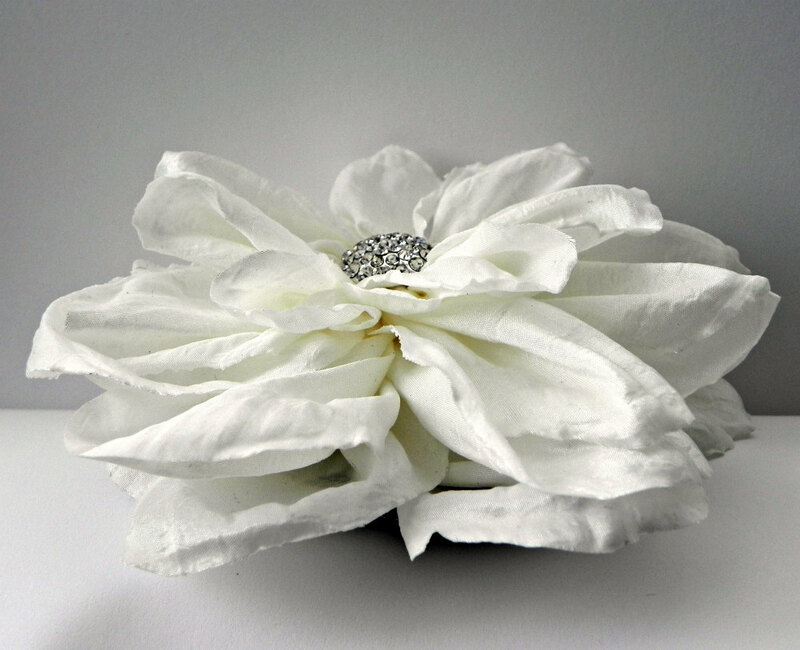 This entry was posted in buy handmade, interviews and tagged bridal, etsy, Feather Fascinator, Flower Fascinator, handmade, wedding, you fancy thing. Bookmark the permalink. Thank you Rebecca! I loved the interview — great questions!